New York, NY, May 23, 2014 — Green Tea Software is excited to announce the latest version (2.1) of its popular Floorplans Pro App for iPad, its popular floorplan creation tool used daily by thousands of homeowners, apartment seekers, realtors, contractors, architects, appraisers, as well as interior designers. For the very first time, Floorplans Pro now features a full 3D viewer that presents an overview of an apartment, as well as a walkthrough mode. All 2D furniture graphics have been given a 3D counterpart. Users can select wall coloring and wallpaper options. 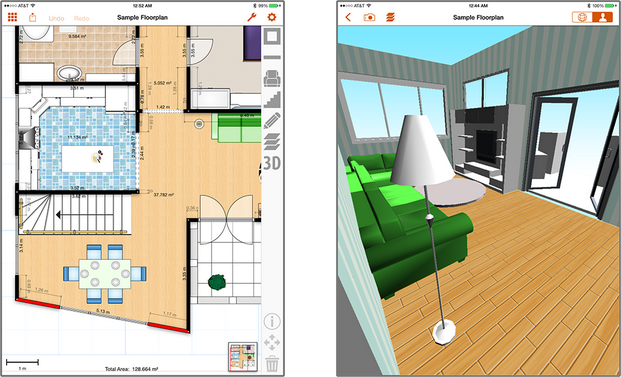 The 3D Viewer is available as an In-App Purchase, allowing existing users to upgrade their already purchased apps. Version 2.0 introduced an entirely redesigned interface featuring a flatter, more modern look akin to iOS 7. Floorplans Pro allows users to create floor plans from a blank canvas, or to import existing files and enhance them with the precision of PDF graphics. Additional furniture packs, such as the CSI pack, extend the app’s existing selection of objects to tailor specific needs: documenting crime scenes, creating fire escape plans, or planning electrical wiring. The Floorplans Pro App is available for $15.99 from the App Store on iPad or at www.AppStore.com/FloorplansPro.